So you’ve decided it’s time to revamp your website, or perhaps you’re launching a new business and need an outstanding website and digital marketing strategy to get you started. Either way, that means finding a Sunshine Coast Website Designer you can trust to get the job done right. Sounds easy, right? Just Google ‘Sunshine Coast Website Designer’ and pick a name. Yep, there are plenty there to choose from, that’s for sure. But how do you know you’re choosing the right one? When it comes to knowledge, skills and experience, not all website designers are the same. For example, exactly what is a website designer? Don’t you mean website developer? What’s the difference? In old-school terms a website designer ‘designs’ the look of your new website – let’s call that the front end. A website developer then makes it all happen by adding the tools and coding – that’s the back end. A website designer always needs a website developer, but a website developer doesn’t necessarily need the designer. 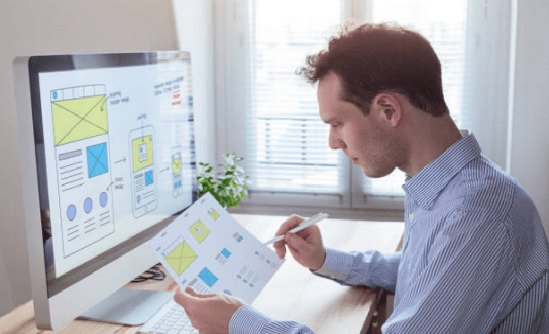 In actual fact, there is a move away from hiring individual designers and developers as businesses recognise the advantages offered by web solutions companies. A web solutions company does it all under one roof, which generally means a better price for the client, better continuity across your brand and the ability to grow your website as your business grows. Your chosen provider should not only have proven experience in designing and developing awesome websites but specifically in your industry. Designing a purely informational website for, say, a charitable organisation is very different from developing a fast and secure eCommerce website. Some business owners deliver a brief and then want nothing more to do with it until the website is up and running. Most business owners, however, like to be involved in the process and kept informed of progress. They also need the website developer to listen to their needs. A good web solutions company will sit down with the client, learn about their business and take note of their needs, goals and budget. Having listened, they can then suggest workable options that deliver the best results. For example, if a suggested element would negatively affect the speed of the website they would offer an alternative solution. If your business is new it’s likely you’re on a tight budget. It’s also logical that your website needs will change as the business grows. Find a Sunshine Coast website designer who understands this and is willing to build in the foundations for future applications now. This will save a great deal of money later on. Choose a provider who can handle all your website design and digital marketing needs under one roof. This will reduce your costs, save time and ensure consistency across your brand. It also means your Sunshine Coast website designer will be invested in the success of your organisation, rather than seeing the job as a one-off.